Originally published in 1980. More so than any other energy resource, nuclear power has the capacity to provide much of our energy needs but is highly controversial. This book discusses the major British decisions in the civil nuclear field, and the way they were made, between 1953 and 1978. It spans the period between the decision to construct Calder Hall – claimed as the world’s first nuclear power station – and the Windscale Inquiry – claimed as the world's most thorough study of a nuclear project. For the period up to 1974 this involves a study of the internal processes of British central government. The private issues include the technical selection of nuclear reactors, the economic arguments about nuclear power and the political clashes between institutions and individuals. The public issues concern nuclear safety and the environment and the rights and opportunities for individuals and groups to protest about nuclear development. 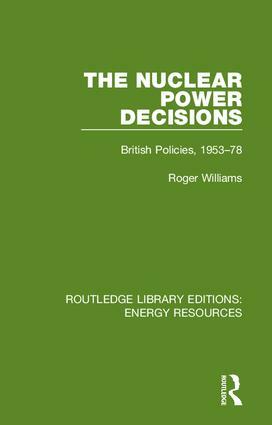 The book demonstrates that British civil nuclear power decision making had many shortcomings and concludes that it was hampered by outdated political and administrative attitudes and machinery and that some of the central issues in the nuclear power debate were misunderstood by the decision makers themselves.